Jorge Alberto De La Rosa … resides in Phoenix, with his wife, Martha … the couple had twins, Bernabe and Matias, June 7, 2010. Went 3-1 with a 4.21 ERA and .240 opponent average in a career-high 65 games in first season with the D-backs, his first as primarily a reliever since 2006 with the Brewers and Royals...His 65 appearances were the sixth most by a D-backs lefty reliever all time...Held lefties to a .194/.253 OBP/.292 SLG with 5 extra-base hits (4 2B, 1 HR)...Led the Majors with a 3.03 inherited runners scored pct. (1 IRS/33 IR), tied for the lowest since at least 1957 (also: Wilton Lopez/HOU in 2010)... stranded his first 24 inherited runners (allowed run on Aug. 18 @ Twins)...Held opponents to a .140 average (7-for-50) with runners in scoring position, including 2-for-28 (.071) with RISP and 2 outs...Was a non-roster invitee to Spring Training by Arizona. POSTSEASON: Pitched in 3 postseason games (0 ER in 2.1 IP)...earned a hold in the Wild Card game vs. Rockies (0.1 IP). The 34-year-old southpaw made 26 starts in his eighth season in Denver. Began the year on the disabled list after suffering a left groin strain in Spring Training ... sent to Triple-A Albuquerque on a rehab assignment April 9, and made two rehab starts in which he allowed a total of three runs in nine innings pitched before being reinstated from the disabled list. Made his frst Major League start of the season on April 20 against San Diego … allowed a career-high tying nine runs in two innings in the 14-3 loss at home.Went 6-4 with a 5.03 ERA (91.1 IP, 51 ER) and a .249 opponent batting average over his frst 17 starts of the season, and then concluded the season by going 3-3 with a 2.81 ERA (57.2 IP, 18 ER) with a .245 opponent batting average over his last nine starts. Went 4-0 with an 0.99 ERA (27.1 IP, 3 ER) in four quality starts on the road from May 16-July 5. Worked six or more innings 16 times, including seven consecutive starts from Aug. 1-Sept. 4, his third-longest stretch of its kind … seven or more innings seven times. According to the Elias Sports Bureau on May 16, his frst win of the year at Los Angeles-NL, became the third pitcher in Rockies history to throw at least seven innings without allowing a run or a walk and no more than two hits in a game … other Rockies pitchers to accomplish this are Jeff Francis in 2006 (9 IP, 2 H) and Jason Marquis in 2009 (9 IP, 2 H). Became the Rockies all-time wins leader on June 14 at Miami, recording his 73rd win in a Rockies uniform after beating the Marlins 4-1. Became Rockies' career franchise leader in strikeouts (788), surpassing Ubaldo Jimenez (773, 2006-2011) on May 21. The Rockies Opening Day starter, the first such honor of his career...tied a career high with 32 starts (also done in 2009) as it was his second consecutive season of at least 30 starts...he signed a two-year contract extension through 2016 with the Rockies on Sept. 4...Led the Rockies in starts, wins and innings, going 14-11 with a 4.10 ERA (184.1 IP, 84 ER)...March 31 at Miami, marked the first career Opening Day start for De La Rosa, as he went 4.1 innings and allowed five runs, earning the loss...first win of the season came on April 21 vs. San Francisco, limiting the Giants to one run over 5.0 innings...the win also marked the beginning of a six-game winning streak that spanned seven starts...snapped his season-long streak on June 3 vs. Arizona, despite throwing his seventh quality start of the year (7.0 IP, 7 H , 3 R, 3 ER)...Began a five-game winning streak on June 24 vs. St. Louis with a 10-5 win (7.0 IP, 10 H, 5 R, 4 ER)...was one of 12 pitchers to have multiple five-plus game winning streaks in 2014, one of six pitchers from the National League...struck out a season-high 11 on July 23 vs. Washington as he went 7.1 innings and allowed two runs (one earned) on eight hits in the win...hurled a season-high 8.0 innings on Aug. 20 vs. the American League Champs, Kansas City...gave up two runs on five hits, walked three and struck out three...In his 15 home starts, he was 10-2 with a 3.08 ERA (90.2 IP, 31 ER) and held opponents to a .228 batting average (74-for-325)...his 10 wins at home tied him for third in the Majors behind Johnny Cueto (13) and Max Scherzer (11)...his .833 home winning percentage (min. seven decisions) was good for fourth-highest in the Majors (Scherzer's .917 winning percentage is tops)...the Rockies finished 12-3 at home when De La Rosa started...Made 11 consecutive starts of at least 6.0 innings, 6/24 - 8/20, going 7-2 with a 3.63 ERA (72.0 IP, 29 ER) in these starts...the streak ended on Aug 26 at San Francisco, when he left in the sixth inning with a left thumb contusion...his 11-game streak was tied for the seventh longest in the NL in 2014...the longest 6.0 inning streak by an NL pitcher last season was 17 consecutive games from Clayton Kershaw. Jorge's 6.0 inning streak tied for the fourth longest in Rockies history...the franchise record for most consecutive starts of 6.0 innings belongs to Ubaldo Jimenez who went 25 straight from 5/1-9/7/09...Since joining Colorado's rotation in 2008, he has gone 69-45 with a 4.20 ERA (858.1 IP, 401 ER) in 156 games with 150 starts...his 69 wins are second-most on the Rockies all-time wins list, while his .605 winning percentage is the highest among any Rockies pitcher with at least 35 starts...over those six seasons (2008-14), he has gone 45-14 (.763) at Coors Field with a 4.00 ERA (439.0 IP, 195 ER) in 79 games with 75 starts...the 45 wins and .763 winning percentage are tops in franchise history, while his home winning percentage since 2008 is second only to Zack Greinke's .782 (61-17). The left-hander made 30 starts for Colorado, his most in a season since he made a career-best 32 starts in 33 games during the 2009 season...De La Rosa has now appeared in 124 games for the Rockies, including 118 starts... De La Rosa had career year in 2013 winning a team-high 16 games...he went 16-6 with a career-best 3.49 ERA (167.2 ip, 65) over 30 starts...he had a 1.92 ERA (56.1 ip, 12 er) in nine day games which led the league and is the lowest ever by a Rockie pitcher...his 17 quality starts tied his career high (2009)...the Rockies were 21-9 in the games he started... De La Rosa finished the year 16-6, pushing his career record in a Rockies uniform to 55-34...De La Rosa's .618 winning percentage as a Rockie is by far the highest mark in franchise history among pitchers with 50 starts as a Rockie (Ubaldo Jimenez 2nd at .554, 56-45)...he is fifth on the franchise's all-time win list and trails Ubaldo Jimenez for fourth place (56)... Jorge establshed a first half career-high nine wins on 7/10 at SD and became the ninth Rockie pitcher to have nine wins before the All-Star Break (Chacin would also get his ninth win on 7/18 at LAD)...a Rockies pitcher has only gotten nine or more wins 11 times before the break... Jorge De La Rosa started 14 games following a Rockies loss...he went 10-0 in those 14 games with a 3.52 ERA (76.2 ip, 30 er) with 29 walks compared to 51 strikeouts...he held opponents to a .257 clip (76-for-296) in those games...his 10 wins following a team loss led all MLB... Jorge went a remarkable 10-1 with a 2.76 ERA (81.2 ip, 25 er) in 14 starts at Coors Field...his 10 wins were tied for second in the NL and his .909 winning percentage at home was second among NL pitchers (Jose Fernandez, 9-0)...it was the second time in his career he won 10 games at Coors Field in a season but it was just the third time a Rockies pitcher accomplished the feat (Gabe White, 2000)...De La Rosa's 2.76 ERA was the lowest ever by a Rockies pitcher at Coors Field, as the previous mark was Ubaldo Jimenez's 3.19 ERA in 2010. The 31-year-old southpaw made three starts after returning from 'Tommy John' surgery...he made seven rehab startsacross four levels of the Minor Leagues prior to making his 2012 debut on 9/20 at SF. De La Rosa's three 2012 starts are his only in the Majors since he tore an ulnar collateral ligament in his left elbow on5/24/11 vs. ARI...in his three starts in 2012, De La Rosa finished with a record of 0-2 with a 9.28 ERA (10.2 ip, 11 er),two walks and six strikeouts...the Rockies went 1-2 in his three starts, winning the only start Jorge had at Coors Field. Was the Rockies starting pitcher in the club's home opener on 4/9 vs. SD...Made four starts in April before suffering a torn pulley tendon in his left middle finger...was placed on theDL for the injury and missed 67 games due to the injury...Prior to being placed on the DL, he went 3-1 with a 3.91 ERA...returned from the DL on 7/9 vs. SD...went5-6 with a 4.29 ERA (98.2 ip, 47 er), 42 walks and 87 strikeouts in 16 starts after returning frominjury...held opponents to a .235 average after his return...Although he made just 20 starts, and pitched just 121.2 innings in 2010, his 4.22 ERA this season is hislowest mark for any season in the Majors, better than his 4.38 ERA of 2009...Went 5-6 with a 4.01 ERA after the All-Star break in 2010...in his career is 26-22, 4.25 (366.0 ip, 173 er)after the All-Star break compared to 23-25, 5.82 (344.2 ip, 223 er) prior to the All-Star break...his 22 postAll-Star break victories since 2008 are tied with Bronson Arroyo for the most among National Leaguepitchers over that time span...Allowed just 20 hits to left-handed batters (20-for-97, .206)...since the start of the 2009 season, lefties arebatting just .201 (51-for-249) against him with 20 extra-base hits and 88 strikeouts to just 25 walks...his.205 opponents average vs. left-handers since 2009 is the fifth-best opponents average vs. lefties amongNL pitchers. Set career highs in every significant pitching category...ranked 2nd among NL lefties in winningpct. (.640), 9th in innings pitched (185.0) and 12th in ERA (4.38)...became just the 3rd lefty in Rox historyto win at least 15 games, joining Jeff Francis (17-9 in 2007) and Shawn Estes (15-8 in 2004)...has back-toback10-win seasons for the first time in his career; he is one of only 3 left-handers in franchise history tolog more than one 10-win campaign (Jeff Francis, 3; Brian Bohanon, 2)...set Rox record for strikeouts by alefty (193), also tied for the 3rd-highest mark in a season by any Rox pitcher...his strikeouts per 9 inningsrate of 9.39 ranked 6th among all NL pitchers (2nd by lefties) in '09...led the Majors with 16 wins from June5 through the end of the season...he earned the win in 7 of his last 11 starts, as well as in 14 of his last 19and 16 of his last 21 games started (Rox went 17-4 in those games)...was winless with a 5.43 ERA (54.2ip, 33 er) in his first 10 starts of the season (0-6, 4 no decisions); Rox supported him with an average of2.30 runs per game during his 10-start winless streak to begin the season...after that (final 17 starts), theclub has supported him with an average of 8.51 runs per game...pitched at least 6 innings 18 times, including9 starts of 7 or more frames...received the loss in his first start of the season 4/11 vs. PHI; retired 5 ofthe first 6 hitters he faced before allowing 5 runs from the 3rd inning and on...took no-decision 4/17 at LADas he left the game in the 6th with a 3-0 lead; Matt Belisle and Alan Embree combined to allow 4 runs inthe 7th to lose the lead for De La Rosa...hard luck loss 4/22 at ARI; started game with 6.0 shutout inningsas Rox lost 2-0...took no decision 4/28 vs. SD despite allowing just 3 hits...struck out career-high 12 hitters5/9 vs. FLA (finished just 2 strikeouts away from the club record, 14 strikeouts; Darryl Kile, 8/20/98 atMontreal); it was the most strikeouts for a Rox pitcher since John Thomson also fanned 12 hitters on10/7/01 at San Diego...12 strikeouts by De La Rosa are a Colorado single game record for a left-handedpitcher...followed that outing with a 10-strikeout performance 5/15 at PIT; the 22 strikeouts in consecutivestarts by De La Rosa represent a club record for a left-handed pitcher and matches the all-time franchiseclub record (also: 22 K's, Darryl Kile, 8 K's, 8/15/98 vs. PHI; club-record 14 K's, 8/20/98 at MON)...De LaRosa also is the only lefty in club history to fan 10 or more in a game more than once...took 0-3 record with13.50 ERA (12.0 ip, 18 er) in 3 starts from 5/20-31...earned first win 6/5 at STL; Rox scored 9 runs in 7thinning to give him the victory (team scored a total of 11 runs in support of De La Rosa in the game, which was only3 runs shy of the 14 they had scored in his previous 10 starts combined)...De La Rosa was the only pitcher withouta win among the 56 National League pitchers who qualified in the ERA category before he got his firstwin of the season...won consecutive starts from June 5-10 (during club's 11-game win streak); went 2-0,3.55 ERA (12.2 ip, 5 er) in those games...finished as one of three 4-game winners for the Rox in June (also:Aaron Cook, 5-1 and Jason Hammel, 4-0)...made his only relief appearance of the season 7/12 vs. ATL(day before All-Star break); allowed a 2-run home run (Brooks Conrad) in his 2nd inning of work... hadcareer best 7-game winning streak from 6/21-7/30; the streak spanned 7 consecutive starts in which DeLa Rosa earned the win, the longest consecutive starts streak to earn a win for a pitcher in Rockies history...the streak was snapped 8/5 at PHI by allowing 7 runs in 5.0 innings; fell to 0-3, 9.78 ERA vs. PHI inhis career...finished 5-0, 2.50 ERA in July; tied for the Major League lead in wins during the month, thoughhe was the only pitcher to go 5-0 in the month (nominated for the NL Pitcher-of-the-Month Award for July butdid not win)...made 5 starts in August, going 3-2 with a 4.88 ERA; allowed 7 home runs, including season-high3 HR's 8/5 at PHI...got 13th win 9/1 vs. NYM; the win snapped a season-long 5-game losing streak by theRockies...considered for the National League Player of the Week award (period ending 9/6), which was wonby teammate Seth Smith...snapped Rox 4-game losing streak with 15th win 9/16 at SF...that win was his6th consecutive winning decision vs. the Giants, which is the longest winning streak ever by a Rockies pitchervs. the Giants (Jeff Francis, 4 games, 5/12/07-8/25/08)...allowed 6 runs, all earned in 2.1 frames 9/22 vs.SD, though Rox would win game 11-10...earned his 16th win of the season 9/27 vs. STL; allowed 3 runs in5.0 innings but struck out 8 batters...did not factor in the decision in his final start on 10/3 at LAD; left in the4th after tossing 3.0 perfect frames with 4 K's...left early with tightness in his left groin...from 9/1 to the endof the season, he went 4-0 with a 2.97 ERA (36.1 ip, 12 er) with 41 strikeouts in his 36.1 innings pitched. The Rockies acquired De La Rosa from the Kansas City Royals in exchange for cash considerationson Wednesday, April 30...De La Rosa began the season with the Omaha Royals (AAA)...he startedthe 4th-most games for the Rockies in 2008 (23) and tied his career high in games started, which he setin 2007 with the Royals...also tied his career-high innings pitched (130.0) that he set in 2007; tossed atleast 6.0 ip in 10 of his 23 starts as the Rox went 9-1 in those games...set career high with 10 wins; joinedteammates Aaron Cook (16 wins) and Ubaldo Jimenez (12 wins) with 10-plus wins, the first time since 2003the Rockies have had 3 starters with at least 10 wins in a season...Rox went 13-10 in his 23 starts...his 128strikeouts were the 3rd-most strikeouts by a left-handed pitcher in a single season in franchise history,behind the 165 Jeff Francis fanned in 2007 and the 138 Denny Neagle fanned in 2001...finished 5th in theNL with an 8.86 strikeouts per 9 innings ratio among pitchers with at least 20 starts; his 8.86 K's/9 ip set aRockies franchise record for a Rox starter with at least 20 games started (previous: Pedro Astacio struckout batters at a rate of 8.85 per 9 ip in 2000...his 128 K's were the 2nd-most on the team...made a total of5 appearances out of the bullpen; in his 5 relief appearances, De La Rosa posted a 2.25 ERA (8.0 ip, 2 er)with 9 strikeouts...after going 3-5 with a 7.26 ERA (57.0 ip, 46 er) in 14 games/11 starts prior to the All-Starbreak, he went 7-3 with a 3.08 ERA (73.0 ip, 25 er) after the break...his post-All-Star ERA was the lowestmark on the Rockies starting staff, and his 7 wins in the second half were second to only Jimenez' 8 post-All-Star victories...his 3.08 ERA after the All-Star break is the lowest in franchise history for a Rockies starterwith at least 10 starts after the break, besting the previous low of 3.28 held by Brian Bohanon in 2000...hadan 8-game stretch in which 7 of the 8 starts were quality outings (7/19-9/1)...in 9 starts from August-Sept.he went 5-2 with a 2.60 ERA (55.1 ip, 16 er) with 46 strikeouts...held opponents to a .262 average (128-for-489)...lefties hit .289 (35-for-121) while righties hit .253 (93-for-368)...held all opponents to a .228 average(59-for-259) after the All-Star break, which ranked as the 10th-lowest opponents batting average afterthe A/S break in the NL...finished 6-2 with a 4.65 ERA (71.2 ip/37 er) in 15 games/12 starts at Coors Fieldin '08; had 29 walks and 66 strikeouts at home...earned 3 wins vs. the Giants but did not log more than onewin vs. any other team; Rox won all 4 of his starts. vs. SF as he went 3-0 with a 1.07 ERA (25.1 ip, 3er)...went a span of 41.2 innings without allowing a home run from 8/5-9/7, and he allowed just 4 homersafter the All-Star break (66.0 ip)...this came after he allowed 9 HR's prior to the break (57.0 ip)...De La Rosamade his Rockies debut 5/3 vs. LAD; gave up season-high 9 runs in 4.0 innings...earned his first win in aRockies uniform in his next start 5/8 vs. STL (5.2 ip, 2 er)...made 3 more starts before being transferred tothe bullpen...made 3 relief appearances from 5/31-6/7, posting a 3.86 ERA in the 3 games...returned to the rotation 6/14 at CWS and allowed just one hit with 8 K's over 5.0 scoreless innings...set career highs instrikeouts in 2 straight starts 6/14 at CWS (8 K's) and 6/19 vs. CLE (10 K's); was one of two Rockies pitchersto fan 10 or more batters in a single game this season, along with Jimenez, who did so twice...is oneof three Rockies left-handed pitchers to strikeout 10 or more in a game in franchise history and is the onlyone to do so in just 6.0 innings pitched...earned his 2nd win of the season 6/19 vs. CLE...earned wins inback-to-back starts immediately following the All-Star break, 7/19 vs. PIT and 7/26 at CIN...allowed just onerun in each start and struck out a total 15 batters in 12.2 innings pitched; was his first time to post back-tobackquality starts of the season, and the first time in his career to allow one run or less in consecutivestarts, although he would do it again in his final 2 starts of the season (9/19-25)...made his shortest startof the season 7/31 at FLA (1.2 ip) and took the loss by allowing 7 runs, all earned...was again transferredto the bullpen after that start...made 2 relief appearances, allowing no runs in 3.1 innings with 4 K's in thoserelief outings...was inserted back into the rotation 8/15 at WAS (2nd straight start vs. Nationals) and wasthe winning pitcher in the first game of Rox' 5-game winning streak; struck out 7 and started a string of 4consecutive quality starts...began September by tossing 7.0 scoreless innings 9/1 vs. SF to earn his 2ndconsecutive victory...won each of his final 2 starts of the campaign to get to 10 wins...allowed one run on3 hits in 6.0 innings 9/19 vs. ARI for his 9th win of the season...allowed only 3 hits in 7.0 scoreless innings9/25 at SF...had a total of 13 strikeouts in his final 13 innings...struck out 5 or more batters in 13 of his 23starts. Opened the season as the Royals No. 4 starter and ended up with an 8-12record and a 5.82 ERA in 26 games, including 23 starts...Set new career highs in starts (23), wins (8), losses (12), innings (130) andstrikeouts (82)...Pitched much better during the day, going 4-2 with a 3.38 ERA (34.2 IP, 34H, 13 ER) in 7 day starts and 4-10 with a 6.70 ERA (95.1 IP, 126 H, 71 ER) in19 night outings (16 starts)...Went 7-1 with a 2.48 ERA (61.2 IP, 61 H, 17 ER) in 11 appearances (9 starts)in games he did not allow a home run and 1-11 with a 8.82 ERA (68.1 IP, 99 H,67 ER) in 15 outings (14 starts) in games he allowed at least one long ball...Went 4-3 with a 3.59 ERA through his 1st 9 starts of the season...issued just12 walks in 57.2 innings during that span, an average of 1.87 walks per 9innings, which ranked 5th-best in the American League...Tossed a career-high 8 innings, allowing just 5 hits and 1 unearned run in a3-1 win over Minnesota on April 22...Posted a 3-0 record and a miniscule 0.82 ERA (22.0 IP, 14 H, 2 ER) in his 1st3 home starts...Walked a career-high 7 hitters on May 24 vs. Cleveland...also allowed a career-high9 runs in the 10-3 loss...Recorded a career-high 7 strikeouts on June 5 at Cleveland...matched thattotal with 7 K's on July 8 vs. Tampa Bay...Made his 1st relief appearance of the season and as a Royal on June 20 at St.Louis, allowing a game-winning home run to the 1st batter he faced in the14th inning to suffer the 7-6 loss...the relief outing was his 1st since May 23,2006 at Cincinnati as a member of the Brewers...Recorded a career-best 3-game winning streak from June 27 to July 8...beatthe Angels, Mariners and Devil Rays, recording a 2.41 ERA over that span...Shutout the Yankees through 5.1 innings on July 26 for the 7-0 win...allowed6 hits, walking 2 and striking out 5...Placed on the 15-day D.L. with a left elbow strain on Aug. 1...made 3 rehabassignments with Wichita before being returned on Sept. 4...reinstated fromthe D.L. on Sept. 11...Made 2 relief appearances and a start the remainder of the year after hisreinstatement, going 0-1 with a 15.43 ERA (4.2 IP, 8 ER). Acquired from the Milwaukee Brewers on July 25 for INF Tony Graffanino...made 10 starts for the Royals, going 3-4 with a 5.18 ERA...the Royals were 4-6in his starts...As a Royal, lefties hit .324 (11-34) against him with 3 home runs, but heldright-handers to a .250 average (38-152)...Had allowed 6 home runs in 95.1 innings in his career prior to joining the Royals,but allowed 10 in 48.2 innings after joining KC...Recorded the win in his Royals debut July 29 at Texas, a 5-3 Royals win...allowedjust 2 runs on 2 walks and 9 hits while striking out a career-high 7 batters in6.0 innings...marked his 1st win as a Major League starter (9 starts)...Won 2 straight starts on Sept. 5 vs. NYY and Sept. 13 at Cleveland...allowedjust 2 earned runs in 10.2 innings during those starts including tossing 5.2scoreless innings against the Yankees before leaving with blister problems onhis left hand...Pitched a career-high 6.2 innings and tossed a career-best 108 pitches, buttook the loss on Sept. 19 vs. LAA...allowed 4 runs on 4 hits and struck out 4...Walked a career high 6 batters in his fi nal start of the season, an 8-1 loss atMinnesota on Sept. 25...issued at least 1 walk in each of his 10 Royals starts...Prior to the season, represented his native Mexico in the World Baseball Classic...made 3 relief appearances, allowing 2 hits and 2 walks while striking out 3 in3.1 scoreless innings. Registered a 2-2 mark for Milwaukee alongside a 5.12 ERA in 43 games....earned his first career win at Wrigley Field on April 8...struck out career-high five batters on April 10 at Chicago (N)...pitched two scoreless and hitless innings in his first Wrigley Field appearance...posted a 2.57 ERA (2 er/7.0 ip) in five July outings...pitched season-high three innings June 5 at Dodger Stadium...went 0-1 with a 2.93 ERA (5er/15.1 ip) in 16 games after the All-Star break...posted a 2.35 ERA (2 er/7.2 ip) in August...averaged 8.9strikeouts per nine innings (42 K/42.1 IP)...struck out multiple batters 14 times...His 38 relief appearances marked the most for a Brewers left. Spent the majority of the season with Triple A Indianapolis where he posted a 5-6 mark alongside a 4.52 ERA in 20starts...posted a 2.08 ERA in a pair of starts in June and went 3-1 with a 2.53 ERA in a three August starts . . .placed on disabled list in Indy with tendinitis in left shoulder May 22 to June 21...recorded a 4-2 mark with a3.35 ERA (20 er/53.2 ip), 15 walks and 54 strikeouts in 12 starts after his trip to the disabled list...was 1-4 witha 6.47 ERA (23 er/32.0 ip), 21 walks and 32 strikeouts prior to being placed on DL...won four of his last fivedecisions with Indy spanning his last six starts...recalled from Indy on August 12...made his Major Leaguedebut on August 14 vs Florida suffering the 11-1 loss...optioned to Indianapolis after the game...recalled fromTriple A Indianapolis on September 3 as part of the September call-ups...made four starts in his second stintposting an 0-2 mark with a 6.11 ERA...struck out Edgar Renteria on September 20 vs St. Louis for his first MajorLeague strikeout...pitched career-best six innings on September 28 at Arizona and recorded his first multi-strike -out game on October 3 at St. Louis in the season finale. Began the season with Double A Portland of the Eastern League going 6-3 with a 2.80 ERA in 22 appearances, 20starts...won five straight decisions between April 19 and June 6...posted a 2.11 ERA during the streak . . .converted a save on July 8 vs New Britain allowing one run in a five frame outing...was 5-3 with a 2.88 ERA in20 starts for the Sea Dogs and went 1-0 with a 1.50 ERA in two appearances out of the pen...promoted to TripleA Pawtucket in August where he posted a 1-2 mark with a 3.75 ERA in five starts for the Red Sox...won his onlydecision with Pawtucket tossing five scoreless frames on August 17 vs Rochester. Went 7-7, 3.65 (120.2 IP, 49 ER) in 23 starts for Sarasota (A) to earn Sarasota Pitcher of the Year honors...Allowed 3 ER or less in 17 of 23 starts, including each of his first 12 starts of the season...Limited the opposition to a .231 batting avg. against, including a .170 mark with RISP/2 outs...Was promoted to Trenton (AA) in Aug. and went 1-2, 5.40 (18.1 IP, 11 ER)...3.88 ERA between Sarasota and Trenton ranked 7th in the Red Sox organization...His 110 K ranked 5th among Red Sox minor leaguers. Signed by Red Sox as free agent on 3/21...Began season w/ Single-A Sarasota and made 12 relief app. (0-1, 1.21 ERA, 4 GF, 29.2 IP, 13 H, 7 R, 4 ER, 27 K, 12 BB)...Promoted to AA Trenton and was 1-3 in 29 G (5.84 ERA, 37 IP, 35 R, 24 ER, 20 BB, 27 K). Played for Monterrey Sultans in AAA Mexican League...Selected most valuable relief pitcher in the Caribbean Series in Feb. w/ 1-0 record and a 3.38 ERA in four apps. for Mexico(2.2 IP, 2 H, 1 ER, 0 BB, 3 K). Began season at High Desert (Ariz. - A)...Played in 2 G (3 IP, 1 H, 3 K)...Played 8 G for AZL D'Backs (14 IP, 3.21 ERA, 12 H, 5 R, 5 ER, 3 BB, 17 K)...Played 13 G for Missoula in Pioneer Lg. (14.2 IP, 22 H, 17 R, 13 ER, 9 BB, 14K). Began pro career in Dominican Summer League and was 1-0 w/4.50 ERA (13 G, 1 SV, 14 IP, 8 BB, 21 K) for Diamondbacks. October 29, 2018 LHP Jorge De La Rosa elected free agency. 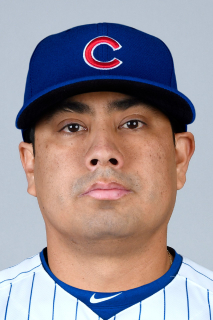 August 10, 2018 Chicago Cubs signed free agent LHP Jorge De La Rosa. August 4, 2018 Arizona Diamondbacks released LHP Jorge De La Rosa. July 31, 2018 Arizona Diamondbacks designated LHP Jorge De La Rosa for assignment. June 14, 2018 Arizona Diamondbacks activated LHP Jorge De La Rosa from the 10-day disabled list. June 2, 2018 Arizona Diamondbacks placed LHP Jorge De La Rosa on the 10-day disabled list. Right Achilles tendon bursitis. March 25, 2018 Arizona Diamondbacks selected the contract of LHP Jorge De La Rosa from Reno Aces. March 13, 2018 LHP Jorge De La Rosa assigned to Reno Aces. February 23, 2018 Arizona Diamondbacks invited non-roster LHP Jorge De La Rosa to spring training. November 2, 2017 LHP Jorge De La Rosa elected free agency. March 28, 2017 Arizona Diamondbacks selected the contract of LHP Jorge De La Rosa from Reno Aces. February 19, 2017 Arizona Diamondbacks signed free agent LHP Jorge De La Rosa to a minor league contract and invited him to spring training. February 19, 2017 LHP Jorge De La Rosa assigned to Reno Aces. November 3, 2016 LHP Jorge De La Rosa elected free agency. May 24, 2016 Colorado Rockies activated LHP Jorge De La Rosa from the 15-day disabled list. May 9, 2016 Colorado Rockies sent LHP Jorge De La Rosa on a rehab assignment to Albuquerque Isotopes. April 27, 2016 Colorado Rockies placed LHP Jorge De La Rosa on the 15-day disabled list. Strained left groin. April 20, 2015 Colorado Rockies activated LHP Jorge De La Rosa from the 15-day disabled list. April 9, 2015 Colorado Rockies sent LHP Jorge De La Rosa on a rehab assignment to Albuquerque Isotopes. April 5, 2015 Colorado Rockies placed LHP Jorge De La Rosa on the 15-day disabled list retroactive to March 27, 2015. Left groin strain. September 20, 2012 Colorado Rockies activated LHP Jorge De La Rosa from the 60-day disabled list. September 10, 2012 Grand Junction Rockies sent LHP Jorge De La Rosa on a rehab assignment to Modesto Nuts. September 5, 2012 Jorge De La Rosa assigned to Grand Junction Rockies. July 13, 2012 Colorado Rockies transferred LHP Jorge De La Rosa from the 15-day disabled list to the 60-day disabled list. May 27, 2012 sent LHP Jorge De La Rosa on a rehab assignment to Colorado Springs Sky Sox. May 9, 2012 Modesto Nuts sent LHP Jorge De La Rosa on a rehab assignment to Tulsa Drillers. May 1, 2012 Jorge De La Rosa assigned to Modesto Nuts. April 4, 2012 Colorado Rockies placed LHP Jorge De La Rosa on the 15-day disabled list retroactive to March 26, 2012. Recovering from June 2011 Tommy John surgery. October 31, 2011 Colorado Rockies activated LHP Jorge De La Rosa from the 60-day disabled list. June 8, 2011 Colorado Rockies transferred LHP Jorge De La Rosa from the 15-day disabled list to the 60-day disabled list. May 25, 2011 Colorado Rockies placed LHP Jorge De La Rosa on the 15-day disabled list. Tear of ulnar collateral ligament in left elbow. December 3, 2010 Colorado Rockies signed free agent LHP Jorge De La Rosa. November 7, 2010 LHP Jorge De La Rosa elected free agency. July 9, 2010 Colorado Rockies activated LHP Jorge De La Rosa from the 15-day disabled list. June 23, 2010 sent LHP Jorge De La Rosa on a rehab assignment to Colorado Springs Sky Sox. April 27, 2010 Colorado Rockies placed LHP Jorge De La Rosa on the 15-day disabled list retroactive to April 26, 2010. Torn tendon in his left middle finger. October 19, 2009 Colorado Rockies activated LHP Jorge De La Rosa. October 6, 2009 Colorado Rockies reassigned LHP Jorge De La Rosa to the minor leagues.